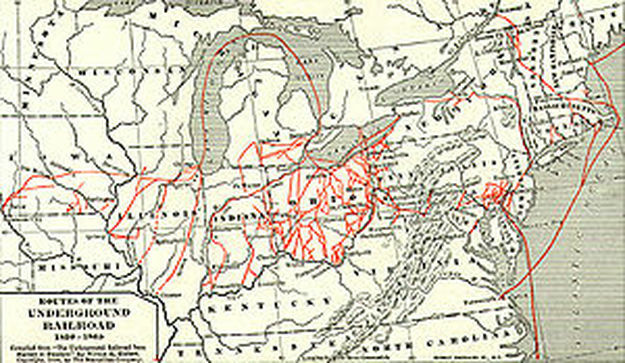 The Underground Railroad was a network of secret routes and safe houses used by 19th-century enslaved people of African descent in the United States in efforts to escape to free states and Canada with the aid of abolitionists and allies who were sympathetic to their cause. The term is also applied to the abolitionists, both black and white, free and enslaved, who aided the fugitives. Various other routes led to Mexico or overseas. An earlier escape route running south toward Florida, then a Spanish possession, existed from the late 17th century until shortly after the American Revolution. However, the network now generally known as the Underground Railroad was formed in the early 19th century, and reached its height between 1850 and 1860. One estimate suggests that by 1850, 100,000 slaves had escaped via the "Railroad".